One of the greatest simple pleasures in my life is homemade whipped cream. And I like my simple pleasures in large dollops, and frequently. It's simple to make and simple to enjoy- it goes with everything from pancakes to fresh fruit, and makes it all so much more delicious. Surprisingly, it has about half the caloric content of butter. Not to say that it's a health food, exactly. And not to bad mouth my dear friend butter, which I would never do. Here's how you make it: take a 1/2 pint of whipping cream (make sure it says "whipping" on the carton, or else you'll be whipping for a long time) and pour it in a medium bowl. Add 1/4 cup confectioners sugar, and 1 tablespoon of vanilla extract. Using an electric hand mixer, beat to combine (about 2-4 minutes) until peaks form (but don't over-mix). 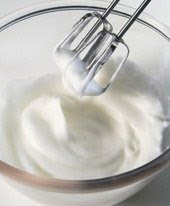 If you feel like getting fancy (you Jacques Pépin, you), you can add cocoa powder, almond extract, Grand Marnier, Cassis, or other flavored liqueurs to make flavored whipped creams. But, really, there's no need to gild the lily... it's most delicious at it's most simple. We went so far as to register for one of these whipped cream makers for our wedding, and it is filled and ready to go in our fridge at all times. It's like Redi-Whip, only tastier (and classier). It makes this simple pleasure even simpler.